Photo from Fotostudio 'Augusta Curiel' via Tropenmuseum, CC BY-SA 3.0. While editing Wikimedia projects in my free time, I stumbled upon this 1931 picture. It’s a beautiful day in Paramaribo, Suriname. A spectacular, huge vessel is floating on the Suriname River. Two women are in the center of the photo; they wear darker clothing, while almost everyone else is in white summer attire. The woman on the right operates a photo camera on a tripod and seems to be documenting the unusual scene in front of her. These two ladies, unmistakably, are Augusta and Anna Curiel. For their contemporaries, this must have been a familiar sight – both ladies together, taking photos, with their wooden tripod and large camera. (…) For many days, Paramaribo had been in uproar. The largest flying boat of all times, the Dornier DO X, would visit Paramaribo on its world trip. 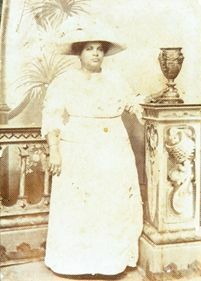 Augusta Curiel, according to her Dutch and English Wikipedia articles, was the owner of a famous photo studio in Suriname in the first decades of the 20th century, and she extensively documented public life in that country. Wikimedia Commons contains more than 300 photographs made by her. This piqued my interest, and inspired me to dig deeper into the topic of early women photographers, on the occasion of Women’s History Month. I turned to one of Wikipedia’s sister projects, Wikidata, to find out more about this topic. Since 2012, the Wikimedia movement has its own structured database that describes the world: Wikidata, the multilingual and free knowledge base that everyone can edit. Wikidata contains more than 45 million items that describe the ‘hard’ data about people, places, and concepts — information like their birthday, profession, gender and nationality. This data can then be used in the fact-boxes on the side of Wikipedia articles. But because this data is stored in a structured database, you can also ask questions of that data. Moreover, like Wikipedia it’s free: anyone can contribute to, and re-use, Wikidata – including website builders, software developers, and researchers around the world. How can Wikidata help you explore a topic, like (in my case) female photographers? And how can you use Wikidata and Wikipedia to publicly spread and enrich information about women like Augusta Curiel? Searching Wikidata with its query engine. I began by trying to find a comprehensive, worldwide list of notable female photographers via Wikidata. I used the query engine to begin my search. Because Wikidata can answer complex questions, it is easier to use for questions like these than Wikipedia, where I would have found hundreds of Wikipedia pages in dozens of languages. I started with a straightforward example: ‘give me all photographers who are female‘, which produces around 3,600 results. If you are not interested in photographers, but rather in women with another occupation (politicians? scientists? architects? ), you can very easily modify this query on the left, by replacing ‘photographer’ in the Query helper with the occupation of your choice. I then decided to make this query a bit more complex, so I modified it to ask for female photographers who have died before 1948 (which means that their work is very likely to be in the public domain) and who have a category of images in our media repository, Wikimedia Commons. When you also retrieve their images and birth dates, they can be shown on a timeline, with pictures. Don’t want to use SPARQL? There’s a different way to search Wikidata. The Wikidata query engine uses the SPARQL query language. If that seems daunting: there is also Wikidata VizQuery, a visual query builder, developed by volunteer Hay Kranen, that lets you create simple Wikidata queries without knowing any SPARQL at all. Find entries in Wikidata in external databases. Wikidata, in fact, functions as a comprehensive ‘hub’ between very diverse databases around the world. 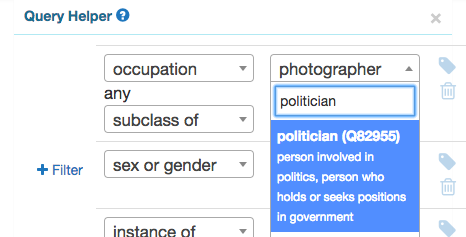 The Wikidata item of any at least a bit well-known person (like Augusta Curiel, or the British photographer Julia Margaret Cameron, who became known for her portraits of celebrities of her time, including Charles Darwin) will contain a section of ‘identifiers’—links to entries for this person in many external databases. Mix’n’match, a powerful matching tool developed by Magnus Manske (manual), helps to make these connections: it lists entries in external databases and suggests which connections might be possible between such a database and Wikidata, which can then be confirmed by hand. In Mix’n’match you can search for specific external databases (‘catalogs’) about photography; one good example is the Photographers’ Identities Catalog, maintained by the New York Public Library. Recently, Magnus Manske has added a new feature where you can match items based on a SPARQL query, so now you can also specifically work on female photographers and their links to various external databases. Once these links are in place, you can discover photographs in any number of other institutions who use those authorities. For example, I discovered that the RKD, the Netherlands Institute for Art History in The Hague, also documents at least one photo by Curiel. See the data about the data: use these tools to see analytics on how people use Wikidata. If you are interested in a set of data on Wikidata, you might also be curious what happens to it. How often are these Wikidata items modified, and in which way? Which Wikidata volunteers are the most frequent editors of these items you are interested in? SPARQL-rc by Magnus Manske shows an overview of edits to a set of data over time (example: edits to female photographers on Wikidata in the last month), and his WD edit stats tool shows which Wikidata users have been most prolific doing this (example: edits to female photographers on Wikidata in February 2018). The Wikidata query engine offers many different options to visualize data from Wikidata (on a map, as a timeline, in an image grid, a bubble chart, a graph…). But an increasing number of external tools offer that option in a much more refined way. Histropedia by Navino Evans and Sean McBirnie displays information from Wikipedia and Wikidata in beautiful timelines. Here’s an example of the timeline of female photographers whose work is in the public domain, as displayed on Histropedia. Wikidata can also be explored in a very different way, with the tool GraFa, developed by José Ignacio Moreno and Aidan Hogan. GraFa is a faceted browser: a tool with which you can search for very general types of things (e.g. artworks, people) and then filter and refine your results. You can try GraFa by exploring and filtering photographs, or female photographers. If I want to write Wikipedia articles about women photographers – for instance contemporaries of Augusta Curiel, I can use a Wikidata Query combined with ListeriaBot (a script written by Magnus Manske – documentation) to create worklists on Wikipedia. ListeriaBot takes a Wikidata query, and presents the results of this query as a regularly updated list on Wikipedia. WikiProject Women in Red on the English Wikipedia, for instance, brings together volunteers who write women’s’ biographies to address Wikipedia’s gender gap. To help them do this, they maintain a ListeriaBot-generated list with the hundreds of Women photographers who have Wikipedia articles in another language Wikipedia, but aren’t yet in English Wikipedia. If I want to show portrait images of women photographers in an external application that I build, I can retrieve this image via an URL that is constructed as follows: https://tools.wmflabs.org/hub/Q2355790?property=image&width=320, which produces the portrait of Augusta Curiel (Wikidata Q2355790) in 320 pixels wide. Augusta Curiel, self-photographed. Public domain. Likewise, Twitter handles can be retrieved as follows: https://tools.wmflabs.org/hub/Q254510?property=twitter – a link that redirects you to the Twitter account of Canadian singer and photographer Melissa Auf der Maur (Wikidata Q254510). Wikidata’s data is actively used in a growing number of websites and applications, including Wikipedia, Siri Knowledge in iOS 11, and VIAF (a database of authors, used by libraries around the world). More than 10,000 Wikimedia volunteers per month actively contribute to Wikidata in this way and with tools like these – and so can you! Every edit counts in making women’s history more visible for more people around the world. Whichever frog pun (or caption) you choose to label it with, the photo above is this year’s Wikimedia Commons picture of the year. It features two Phyllomedusa rohdei, frogs endemic to Brazil, with one stepping on the other’s head, seemingly reaching for something just out of the frame. The photo was taken by biologist Renato Augusto….